Trou d’eau Douce is the typical island village situated on the east coast of Mauritius. The name of the village means “sweet water hole”. It is where the river meets the ocean. 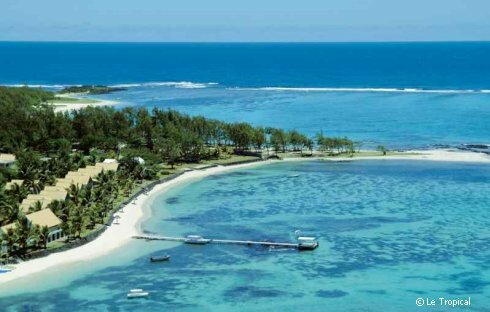 It is the perfect example of ancient Mauritius as Trou d’eau Douce has maintained the charm of old Mauritius making it a perfect getaway for a quiet and relaxing island holiday. You can enjoy the beautiful scenery while sailing in the translucent turquoise lagoon bordered by one of the most beautiful white sandy beaches on the island. One of the best place to visit while you are on a holiday in Trou d’eau Douce is the island of Ile aux Cerfs. The amazing Ile aux Cerfs Island lies across the bay of Trou d’Eau Douce where you can reach within minutes by speedboat. You can enjoy abundant of water sports activity there. Whenever you visit Trou d’eau Douce you should also visit the Bon Secours church situated mid way between the mooring place and the bay. The stained glasses tinged with blue covering the vault are in a perfect harmony with the azure sea. The church overlooks the flowery scenery which attracts the visitor. You can enjoy a great 3 hours of Tight Lines Fishing Trip departing from the village of Trou D’eau Douce. If you don’t have any fishing experience, you need not worry at all. Tight Lines Fishing is a fly fishing technique that is ideal for beginners and can be mastered quickly. Tight line fishing trip starts at 07:30am, and returns to the Trou D’eau Douce shore at around 10:30am. Along with fishing you will get to enjoy the cruise along the east coast going in and out in the lagoons and viewing the amazing scenarios of the surroundings. Trou d’eau Douce has a lot of beautiful little cottages, private self-catering villas, and splendid hotels, most of them with breathtaking ocean views. Silver Beach Hotel is one of the most affordable hotels in Trou d’eau Douce. You can either get a Taxi, or a Bus or even rent a car or a bike there. At the end of your journey, a visit to the local craft market is a must. There, you can buy a fluffy Dodo, hand-made wicker hat, an exclusive embroider rug or a local painting to remind you of the sweetness of Trou d ‘Eau Douce and its inhabitants.